← Sharing land value with communities: An open letter of advocacy to England’s SoS for housing etc. 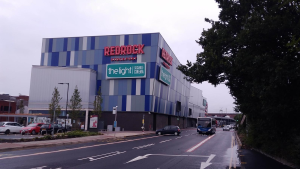 The 2018 winner of the Carbuncle Cup is Redrock Stockport, a £45m leisure complex and car park designed by BDP for the local council. The original nominator dubbed it ‘one of the most horrendous architectural responses ever conceived for Greater Manchester’. The judges included BD’s architecture critic Ike Ijeh, the critic and author Jonathan Glancey and Rosemarie McQueen, who has decades of experience in urban planning and regeneration at Westminster council and is now a commissioner for Historic England. They objected to the awkward form, disjointed massing and superficial decoration. The building is essentially a series of boring boxes jazzed up with arbitrary angles and garish cladding totally out of keeping with the local area.